It’s important to be aware of the rhythms of life and go with the flow. Sometimes, you need to take time in your schedule to think and reflect. Don’t ignore those moments. In this episode of The New Music Industry Podcast, I share why you need to take time to reset. As I record this, we’re headed into the last month of the year. And, I figured it’s never too soon for a little early reflection. Typically, I would leave that to the beginning of the year, because if you’ve been with me for any length of time, you know I put a lot of effort into the early year content as it were. This is the time of year when retailers go crazy trying to capture as many sales as they possibly can. The Christmas and holiday music start to spin on high rotation. Christmas lights begin to go up, warming the cold air and lifting our spirits. Well, that’s what it’s like where I live anyway. I know that if I spent a lot of time scanning Black Friday sales that I could easily be tempted into buying a lot of things, so I try to avoid the hustle and bustle and instead concentrate on my projects. But this time of year, I also like to spend time relaxing, watching movies, playing video games and so on. The cold winter tends to force me inside, and though I’m a huge fan of summer, this time of year isn’t so bad if you’re intentional about making it fun. And, as I’ve already hinted at, it tends to be a great time for reflection too. Recently, I’ve had to make some challenging business decisions. And, these decisions were in-line with one of my theme words for the year – war. The idea, from the very beginning, was to wage war on the mediocre and the things that aren’t serving me. But it took a while for the lessons to sink in. I’ve finally come to the point where I’m no longer willing to accept anything less than excellence, especially in the area of fulfillment and payment. There were several things I said “no” to earlier in the year, and this is something I talk about in more detail in The Essential Guide to Music Entrepreneurship Pro Packs, specifically the ones containing the video titled The Top 10 Lessons I’ve Learned in Music Entrepreneurship. Little did I know that the hardest “no” of the year wouldn’t come until much later. But having gone through the personal development work I’ve done this year, I’m beginning to see, with increased clarity, my way of being to this point. I can see that I didn’t have access to a different way of being until I discovered some things about myself. In the past, I spent a lot of time engaging in pro bono or discounted work. I gave my best in situations where the people or organization didn’t deserve it. I took on projects at the risk of my own health, wellbeing and financial wholeness. That simply can’t happen anymore. The steaks are much too high now, and the projects I’m working on are more important than anything I’ve every worked on before. I’ve come to the realization that I must protect that with everything I’ve got. My business coach, James Schramko often tells business owners to “do less”. I now understand this better than I ever did. Doing too much doesn’t allow you to focus on the big domino. What’s the big domino? The task, project or activity that could potentially make all your other activities unimportant or irrelevant. So, knocking down the big domino could mean knocking down a lot of the little dominos that are taking up space in your mind. When coaching others, depending on what stage of business they’re in, I will advise them to go after that big domino. First, it causes you to think about what’s most important in your business right now. Then, it leads you to prioritize it over other plans, ideas and squirrels that come to distract you. So, clearing space in your life allows you to focus on that big domino. For me, that’s either marketing my current offer or creating my next one. If I could spend all my time doing those two things, I could get so much more done. That’s not realistic right now because I have other projects, I’m engaged in. Those projects help me make a living, fulfil me in some capacity, or both. But I am taking a more serious look at projects these days, and I’m letting go of what isn’t the highest and best use of my time. My naturopath recently shared with me that he asked one of his clients why he was so successful. Apparently, he responded by saying that his secret to success was that he let go of five clients every single year. Wow. So, doing less is doing more. And, that’s why I’m taking a bit of time to reset and consider my priorities. As with any other year, there are things that have gone well and others that haven’t. I’ve learned and grown a lot, and that has helped me better understand my own value. That’s probably the biggest realization of all. Like anyone else, I have bills to pay. Those bills don’t get paid when I take on projects that don’t respect me or my time. I know that some people don’t have this problem. But it’s not uncommon in the music industry for people to charge less than they’re worth. Many musicians take free or pay to play gigs because they simply see no other way. Business owners serving musicians often mark down their products, so they are well within reach for most musicians. Now, there is a strategic component to that, and I can appreciate that. But you can’t serve others out of scarcity. You can only serve them out of your overflow. Don’t throw pearls to swine. You may have heard the expression, “give an inch and take a mile” before. It’s the same idea. When people don’t appreciate you or respect you, it’s not worth working with them. They will take more than they give, ultimately leaving you in a worse position than you were when you started. Michael Port’s Book Yourself Solid and Tim Ferriss’ The 4-Hour Workweek both suggest that you should fire your worst clients. What you gain back in terms of peace of mind is well worth the loss in revenue, which will likely amount to nothing. 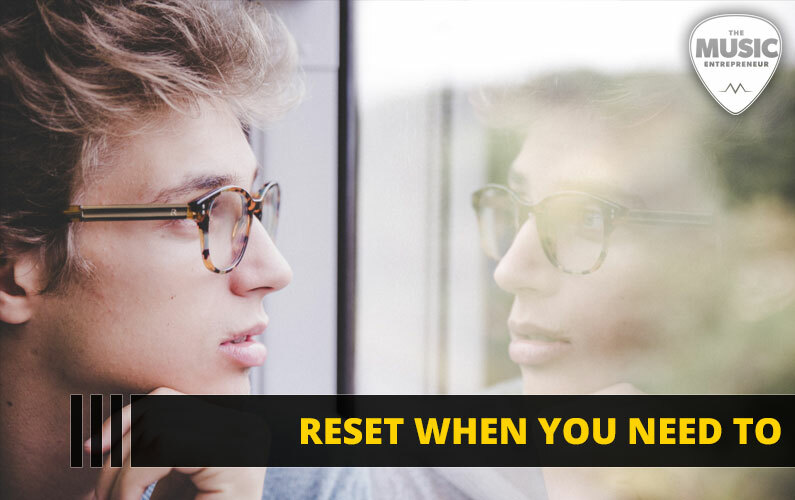 So, if you need to reset now, don’t wait until later. Do it now. Did you get something out of this? If so, I want to invite you to explore new possibilities for you and your career with The Essential Guide to Music Entrepreneurship, specifically the Pro Packs, which are only available for a limited time.